Tea, a drink with jam and breeeaaaaaad! This is how we start every day. PG Tips rock. The Scout likes his with honey. Bleech. I like mine with just milk. This entry was posted on 19 July, 2007 at 9:07 am and is filed under Food & Drink, Let's Get Visual. You can follow any responses to this entry through the RSS 2.0 feed. You can leave a response, or trackback from your own site. Hey, that’s a song. Or a nursery rhyme. Or something. I put milk in my tea and people make fun of me for it. Sorry, but I’m a coffee girl through and through. 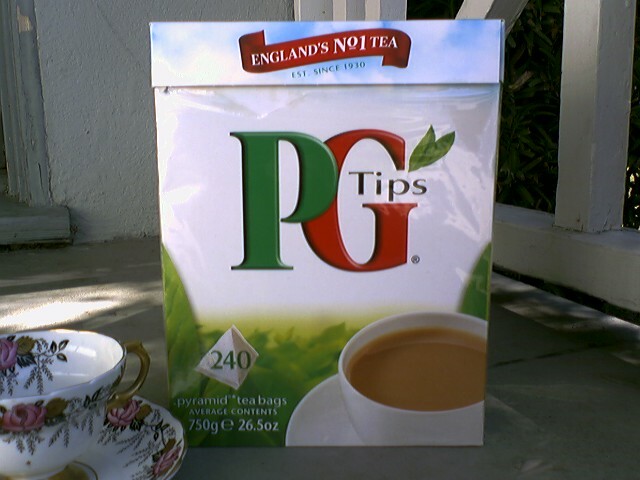 Oh, PG Tips is lovely in the morning. I prefer a full bodied Earl Grey in the afternoon, and before bed I am frequently consoled by Chado’s Midnight Blue White Tea.